“I’m afraid Duke that I’ve had it with you” | Bob's Jazz Blog. “I’m afraid Duke that I’ve had it with you” comes from a letter that Norman Granz wrote to Duke Ellington April 11 1967. After Granz stopped the JATP tours in the US he concentrated on his management for Ella Fitzgerald and Oscar Peterson, organizing JATP tours in Europe and producing jazz albums for Verve records. Granz also started to work for and with Ellington. Their relationship resulted in a number of projects like the film Jazz on A Summer’s Day in 1966, tours in Europa and albums. However their relationship deteriorated as Granz felt that Ellington treated him merely as a servant rather than a manager. In the same letter Granz asked Ellington to hire “a new so called manager”. 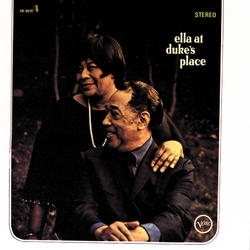 But in 1965 things were OK and they worked on the album “Ella at Duke’s Place“ and here is an incredible swinging live version of Ella and Duke’s band in “Sweet Georgia Brown”. « Live ! Dutch Ladies Of Jazz.